Spring is here and suddenly we are all raring to go! No? Well with the trees are turning lush green, the Red Squirrels are darting about and the skies are beginning to fill with Swallows. It is all happening in the natural world and Highland Safaris love launching their Spring Watch Safaris. 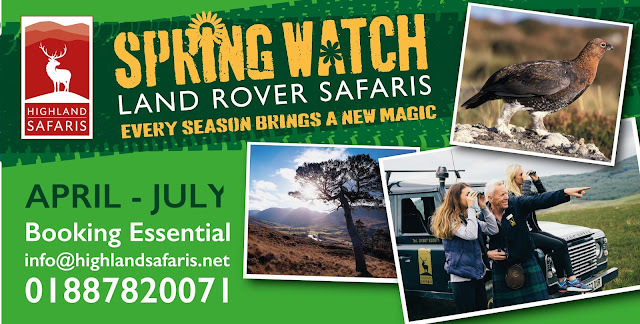 Spring Watch Safaris really are the best way to experience spring in all its glory. 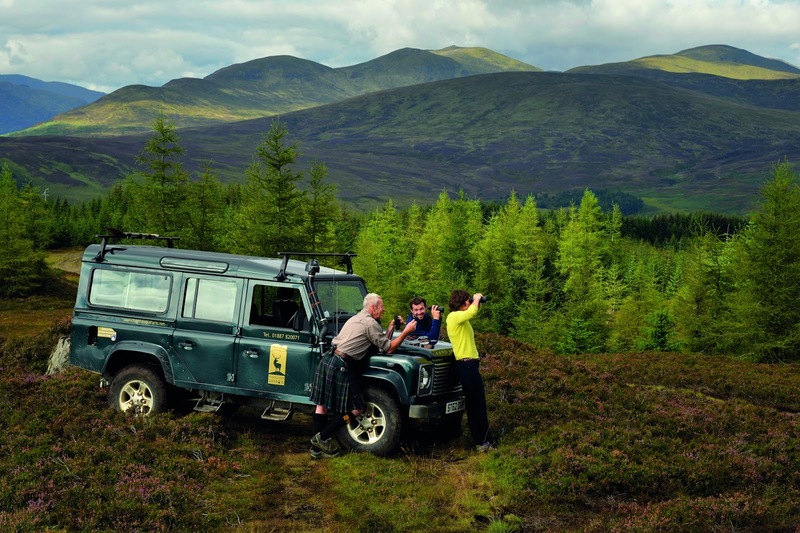 An early departure in a Land Rover ensures you witness the majestic dawn chorus, catching Highland Perthshire’s nature as it wakes up for the day, soaking up the beautiful vistas offered up by the mountains! 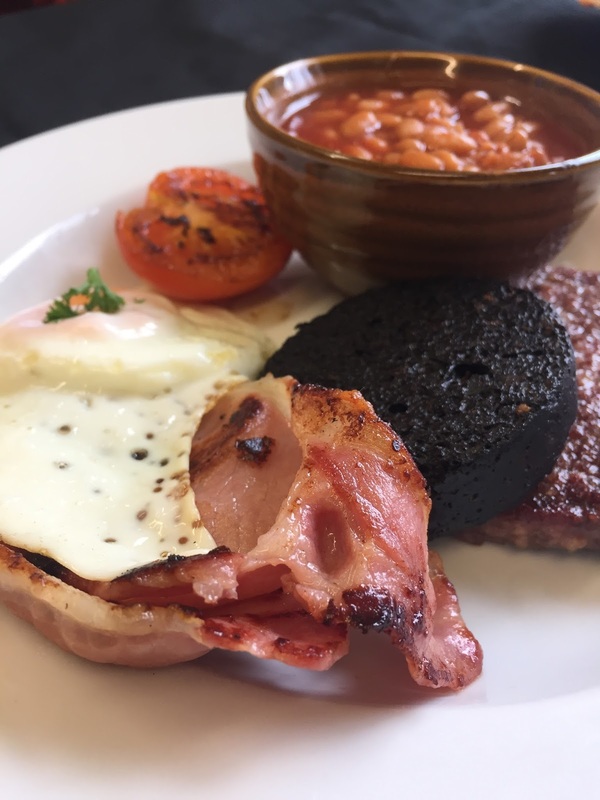 After your Safari what better way to round off the experience than a fresh homemade breakfast and Glen Lyon coffee back at Highland Safaris Cafe? Unwind in our warm and cosy café and regale us with stories of you early morning adventure. 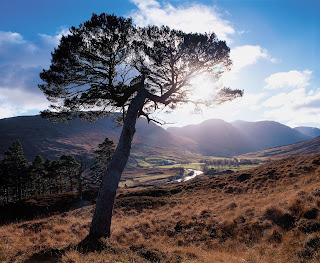 We love our amazing Highland Perthshire environment all year round! Here, amongst the forests, lochs and mountains, the changing seasons are so visible. This time of year though, as Christmas approaches, there are many special opportunities to take advantage of – let us share with you here five magical things to do in Winter! 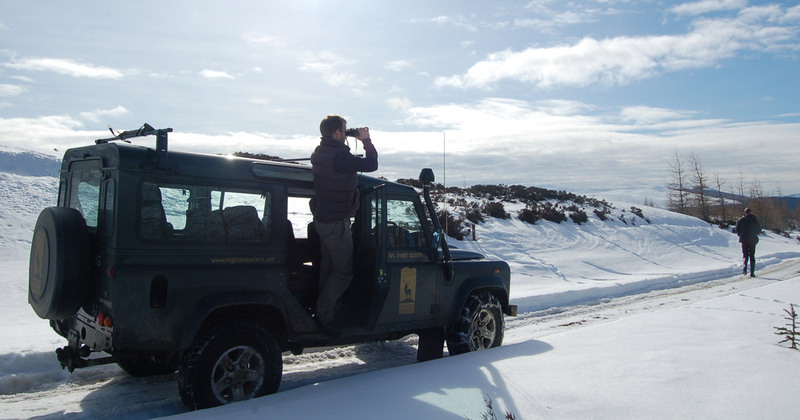 1) Enjoy one of our superb WinterWatch Safaris where you can travel in comfort and safety in one of our 4X4’s to a sub arctic world, seeking out the arctic hare, the Golden Eagle and the elusive Red Deer. Marvel at the sparkling mountain vistas as you enjoy a reviving Dram in one of our cosy Mountain Bothies! 2) Visit Dewars World of Whisky nearby, one of the most popular Distilleries in the area, and a consistent winner of Best Visitor Attraction Awards! Learn more about how the Water of Life is made! 3) The newly opened Grandtully Hotel in the hamlet of Grandtully just outside Aberfeldy is attracting acclaim, and is well worth a visit. Run by the team behind Ballintaggart Farm, it’s a showcase for locally sourced produce. 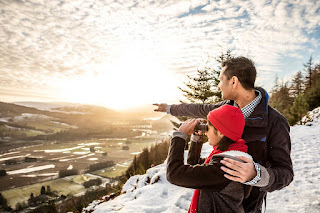 4) If you’re feeling energetic in the crisp air, or perhaps to walk off a big breakfast, why not walk the legendary Birks of Aberfeldy, immortalised by Robert Burns in one of his most famous poems! Watching the hills turn from shades of green and brown to a rich, vivid purple is one of the great joys of the Highland summer. The heather blooms for a few weeks from July into August, and the wild hill landscape comes into its own. Guests on our hilltop Safaris at this time of year have a unique experience. The hill hums from dawn to dusk with honey bees hard at work, making the most of their short season. We are very fortunate to be at the heart of Perthshire, one of Scotland’s premier areas for pure heather honey production. We have recently learned that most honeys such as Manuka are often a mixed bag of various plants, but that Heather Honey is pure, and we can certainly testify that its wonderful strength and aroma is the essence of the Scottish Moors. 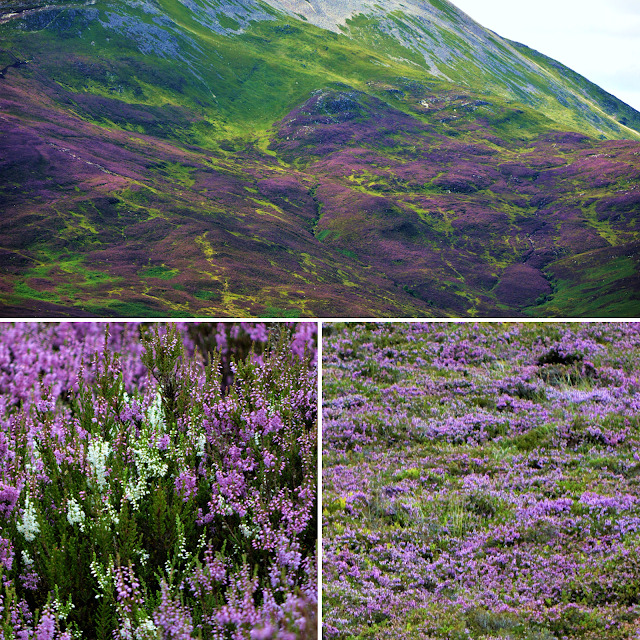 These images, captured by our award winning Safari Ranger George McDonald, show the heather at its peak, and a rare find of white heather that a keeper or walker would traditionally stick in his cap for luck. George and his fellow award-winning Safari Rangers are celebrated for their knowledge and comprehensive commentary on the seasonal wildlife and landscape features of the hills, as well as relating the history, heritage, geology and geography of the area. The spectacular views over Strathappin change weekly, and the precious weeks of blooming heather are an annual favourite among Rangers and guests. At myhotelbreak, we have decades of knowledge in giving our customers the perfect hotel experience. Whether that’s for a night away or for a city break, we have the experts on hand to give you the best possible advice and opportunities. With that said, a fantastic getaway is more memorable with must see attractions nearby. 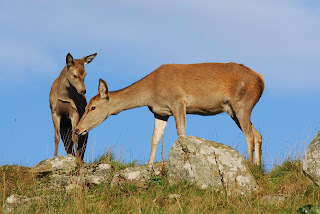 One of the must see attractions is the Highland Safaris in the North of Scotland. The Highland Safaris is a five star, multi award winning visitor attraction and an exceptional destination. 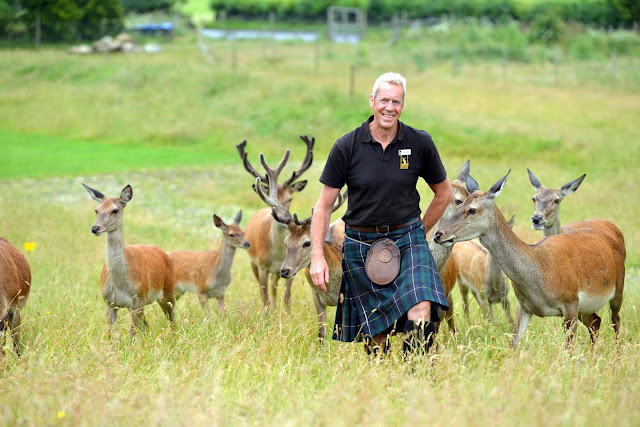 With 25 years of experience the safari tours access the natural beauty of Scotland on private land reaching heights of nearly 3000 feet in the company of knowledgeable kilted Safari Rangers. Marvel at the scenery in a land steeped in history exploring one of Europe’s last wildernesses. The Highland Safari offers individuals, families and groups a unique and authentic experience adding a taste of the wilderness on these small personalised Safaris. As winners of the ‘Best Visitor Experience’ in Scotland Highland Safaris combines the new Red Deer Centre with the exhilarating land rover safaris, inspiring walking and biking activities and Perthshire’s only Gold and Gem Panning Centre. We encourage you discover the Highlands of Perthshire through an invigorating walk where you can discover what the area is all about and the natural beauty in which it beholds. 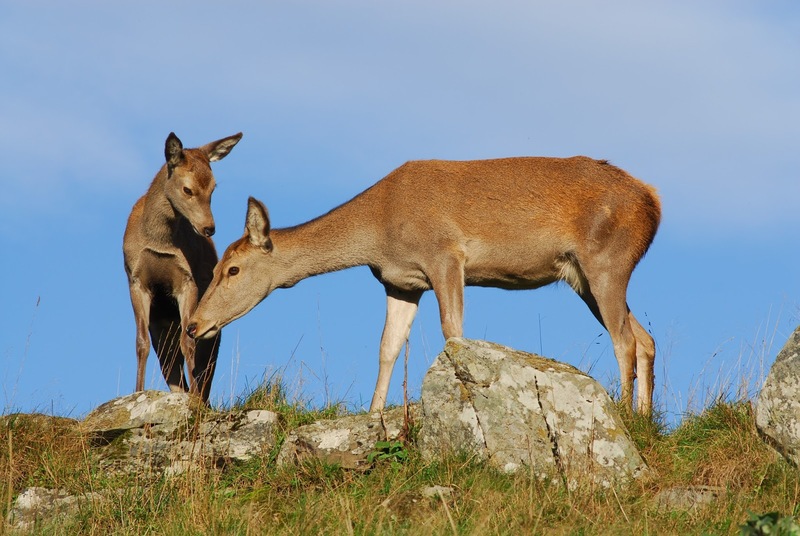 Learn about geology and the history of the area and no doubt you’ll discover some of the Red Deer in the wilderness as well. Relax and enjoy the Highland Safaris Café and Shop set in a unique and stunning location. 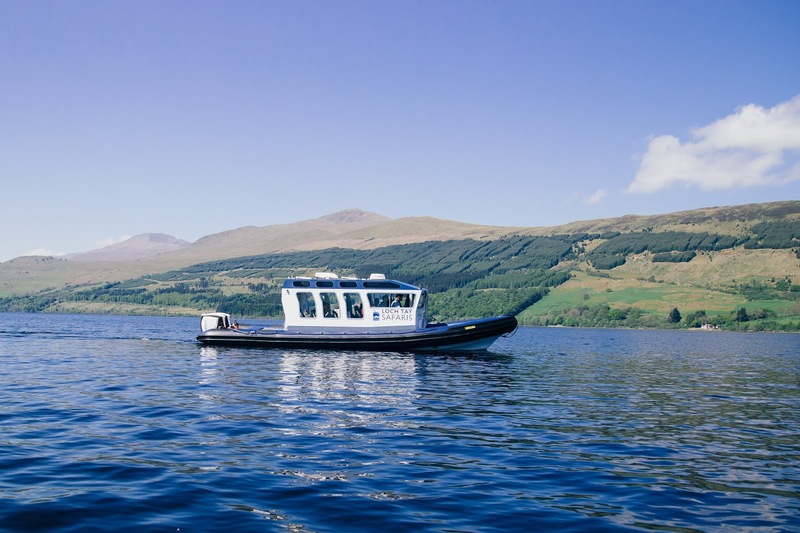 In 2017, they launched Loch Tay Safaris - taking their expertise on to the beautiful waters of Loch Tay, Perthshire’s largest most beautiful and mystical loch. Highland Safaris is open all year round. Whether you’re staying at The Moness Resort or elsewhere in the area make sure you take a day at the Highland Safaris for an unbelievable experience for all the family. Summer is a special season at Highland Safaris. We love the atmosphere summer brings with happy people gathering in our grounds to go on Safari, enjoy lunch in the sun or to visit our Red Deer Centre; there is a real buzz! holiday or a bit of adrenaline – you will not be disappointed! Our flagship seasonal safari will leave you speechless.. Nothing can prepare you for the beauty, peace and tranquillity of our hills and glens on our Highland Perthshire Estates at dusk; the fading light offering amazing photo opportunities. Seeing the evening light from a remote spot 3000' up is the highlight of our very special Sundowner Safari. In the company of an experienced Safari Ranger, this mountain environment offers a chance to witness amazing highland wildlife. The serenity and sheer magnificence of this vista will become an everlasting memory. 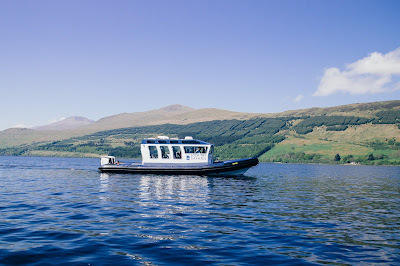 This year we launched Loch Tay Safaris, a unique and exceptional cruise on Loch Tay that combines the history and heritage of the area with the natural beauty of Highland Perthshire. Our brand new boat, Iolaire, is a great way to see Perthshire from another perspective, our live commentary will thrill you as you pass by ancient settlements, forested shores and some of the largest mountains in the UK. 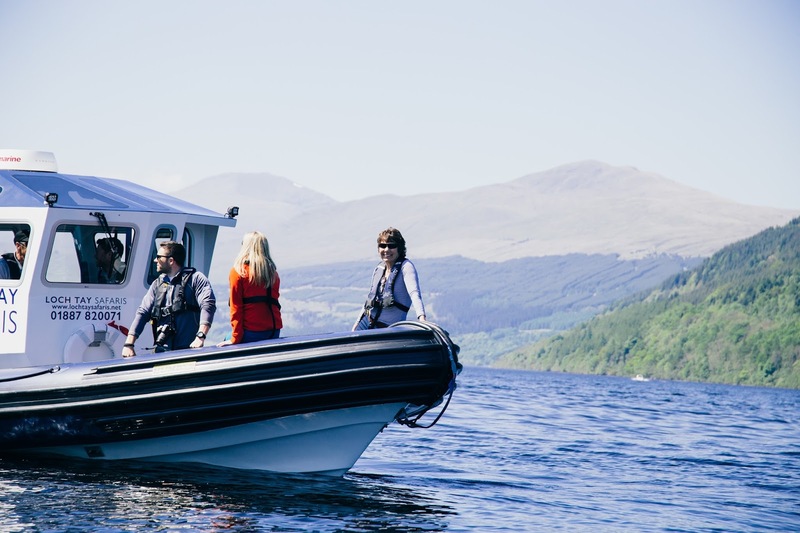 Iolaire is a fast and comfortable cabin RIB making her warm and dry to travel in no matter what the weather brings! 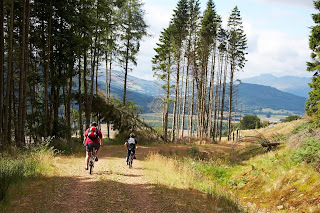 Highland Perthshire has exceptional cycling to offer, with routes to suite everybody’s ability. It is a fantastic way to get around the countryside and you can often end up in special places that nobody else goes, making relaxation and connecting to nature effortless! For those of you who would like the rush of adrenaline on your holidays we also have our Biketrax skills loop which is perfect for all ages. You can also take out one of our excellent hire bikes and explore the local area at your leisure. 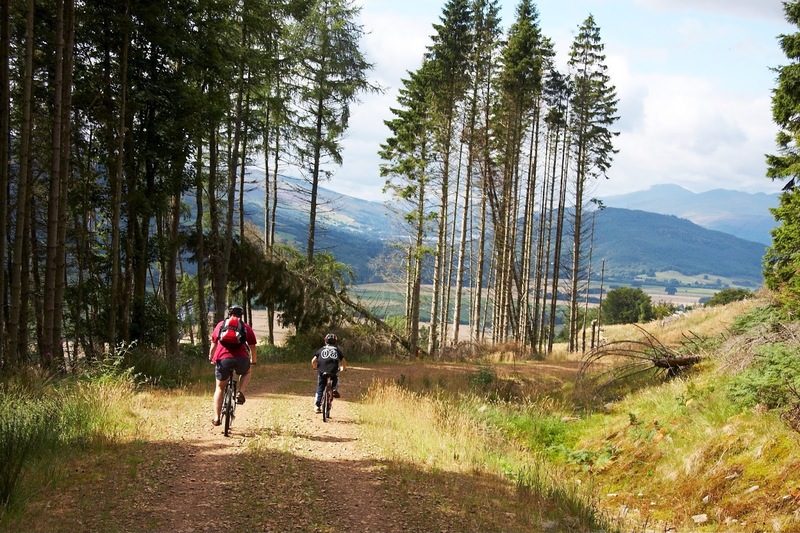 For the more adventurous biker you can go on one of our Biking Safaris - get transported to the high tops in one of our landrovers and get “dropped at the top”!